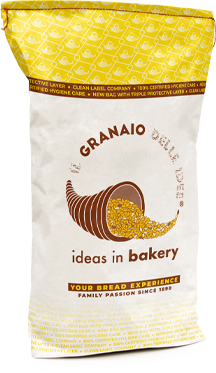 Specifically formulated for the production of exquisite cereal breads, this Nucleo® for bread contains a selected blend of flour, seeds and cereals, all of them of organic origin. 9 Cereali Bio contains soft wheat, durum wheat, corn, oat, rice, rye, millet, spelt and barley. 9 cereals which, together with spelt sourdough and malted barley flour, enhance the flavour of the finished product, making the bread tasty and refined.